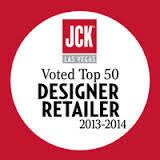 Adamas Fine Jewelry | Adamas voted Top 50 Designer Retailer by JCK! We’re so pleased to share that we’ve been recognized by JCK (Jeweler’s Circular Keystone) as one of their top 50 jewelry design companies for 2013-2014. JCK – the jewelry industry’s leading trade magazine publisher and event host for what is the largest jewelry show held in North America – honored Adamas Fine Jewelry at this years show in Las Vegas. Adamas was selected for excellence in not only displaying and merchandising fine designer jewelry but also educating consumers on the quality of designer jewelry and commitment to fair business practices. Two things we’re especially proud of. We’re honored to be in the company of first-class jewelry retails such as Bergdorf Goodman, Lux Bond & Green and Ylang Ylang.